Sometimes when we make travel plans, life gets in the way and we may want to cancel our existing reservations. This is no different for Airbnb guests. As a host, cancellations aren’t fun, particularly if it’s a last-minute one, leaving very little time to find a new guest. Therefore, it’s important to choose the right Airbnb cancellation policy. Flexible – Guests are entitled to a full refund one day prior to arrival. Moderate – Guests are entitled to a full refund five days prior to arrival. Strict – Guests are entitled to a 50% refund up until one week prior to arrival. Super Strict 30 – Guests are entitled to a 50% refund up until 30 days prior to arrival. Super Strict 60 – Guests are entitled to a 50% refund up until 60 days prior to arrival. Long Term – First month down payment is required; 30 days notice is necessary for lease termination. Which Airbnb cancellation policy should you choose? The short answer is, it depends. For new hosts, I definitely recommend the flexible policy. For seasoned hosts, it could be flexible or moderate. I advice against using the strict cancellation policy. Note that the super strict 30 and super strict 60 cancellation policies are only available by invitation and under special circumstances. I’m not sure what these are and I’ve never seen anyone use these. When I say new, I mean hosts who haven’t reached near full occupancy yet. An empty room or house makes nothing, so if you have big gaps in your calendar, the last thing you want to do is deter guests from making a booking by having a moderate or strict cancellation policy. If you’ve been doing Airbnb for a while and you’re almost always fully booked, you could use the flexible or the moderate policy. I don’t have a strong opinion on which of these is better. 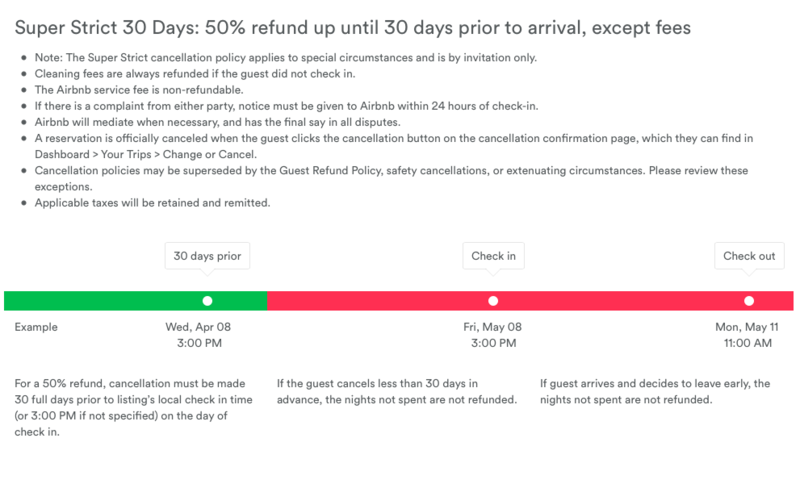 The main difference between these policies is that the moderate policy offers the guest only a 50% refund when cancelled less than five days before check-in, and a full refund if cancelled earlier. The flexible policy provides a full refund if cancelled more than a day in advance. As you already have a strong reputation on the Airbnb platform, I don’t think a moderate cancelation policy will lose you a lot of bookings. At the same time, it doesn’t offer much protection either, because from my experience (I’ll provide some numbers below) cancellations happen more than five days in advance, so both policies would provide a full refund to the guest. 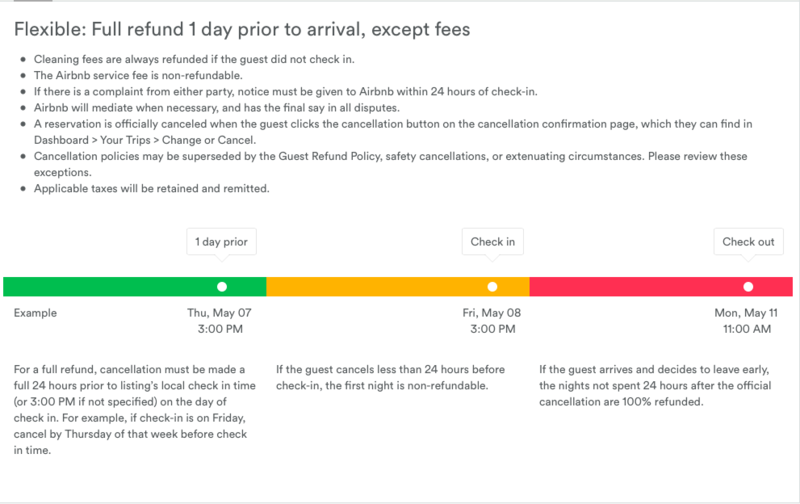 The difference between the strict policy and the other two is quite significant, as guests are not eligible for a full refund, no matter how long in advance they cancel. I strongly believe this policy deters users from booking and the vast majority of bookings lost wouldn’t have been cancelled anyway. Here’s why. First of all, cancellations are pretty rare in general. With a moderate cancelation policy in place, I accepted 379 reservation requests during my hosting journey in Amsterdam, and only 33 cancelled. That’s less than 9%. That means that only about one in twelve bookings were canceled. Only one of these bookings was cancelled less than five days before check-in, so I got to keep 50% of the booking amount. I lost a total of 25 booking days as a result of the cancellations. I calculated this by looking at the days that were cancelled and how many of these days I managed to book after the cancellation. In other words, during nearly five years of hosting, only 25 booking days were cancelled that I didn’t manage to re-book. That’s a very small number, about 2.5% given that I’ve hosted a total of 1087 days. I’m fairly confident that if I would have had a strict cancelation policy in place, I would have hosted significantly fewer days. The reason is simple. Our brains are wired to always consider the worst case scenario. Whenever we commit to something, the “what if?” question pops up. This can make us feel uncomfortable to commit, specially when dates are far into the future. This is the reason that hotel bookings websites have started to offer the free cancellation option up until the day before check-in for a lot of hotels. It gives the booker the peace of mind that if plans would change, they can cancel. However, it’s very rare that these plans actually change, as you can see from the numbers that I provided. If you want to easily access this data for your listing, in your Airbnb dashboard go to “Your Reservations,” scroll down to the bottom and select “View all reservation history.” Then click on the “Print this page” in the top right corner. Now use the “find” function (usually ctrl-F or command-F) and search for “accepted” to find your total number of reservations and “cancelled” for the total amount of cancellations. Now scroll through the list to count the “fake” cancellations. I had 11 out of 44 that weren’t real cancelations, these were bookings where the booker made a mistake, cancelled and made a new booking. The new policies are simplified in the sense that all policies now include a period of time where the guest can cancel without any financial loss. Clearly the new policies are more in favor of the guests and the initial reaction from Italian hosts isn’t very positive, as could be expected. Airbnb is aiming to make their platform more user friendly by incentivizing hosts to adopt the flexible cancellation policy. Although I understand the pushback from hosts, in the long term I think this is a good thing. The increased user-friendlyness will help the platform attract more users, which will benefit hosts. Interesting numbers Jasper. I use Instant Book with the strict policy and checked my data over the last two years – 91 bookings/199 nights with only one cancellation which I was able to re-book. I also have my own booking platform attached to my website, and have a 14-day cancellation policy – no charge except for a $50 admin fee. I’ve found that I get a few more cancellations on this platform that on my “strict” Airbnb platform. It may be that I have significant demand and tend to book well in advance, and therefore the cancellation possibility is less of an issue. Either way it was an interesting exercise to go through. Thanks for the inspiration. I am an occasional host, our town is very seasonal and I think we should be able to have different cancellation policies dependent on dates. Good point, I like the idea. What if people have paid,staying and decide it’s not to their standard? Do they get a refund ? If so how much,as clearly too late to re-book! It depends on your policy, if it’s flexible than nights 24 hours after the cancellation are 100% refunded, 50% for moderate and no refunds if you use the strict policy. If you advertise your listing accurately on Airbnb, you’ll find that this is extremely unlikely. I’ve hosted over 400 groups and had this situation only twice, one of which the guests didn’t ask for a refund.